The Pererenan cliffs are a great place to stop on the west coast of Penida. From the parking area, if you take a right you’ll arrive at Pererenan cliff point, a great view with tons of tiny manta rays swimming around in the ocean below. There’s a rickety wooden platform here that you can climb onto for even better views of the cliffs. In the distance you can see a Hindu temple out there on the point, but access isn’t allowed. If you go left from the parking area, you’ll get another view of the Banah rock and then a steep path to hike down to Seganing Falls. This hike takes about 30-45 minutes and it’s not sandal friendly. The falls at the bottom are nothing amazing, more of a small stream than a waterfall, but it’s still a neat spot to check out. 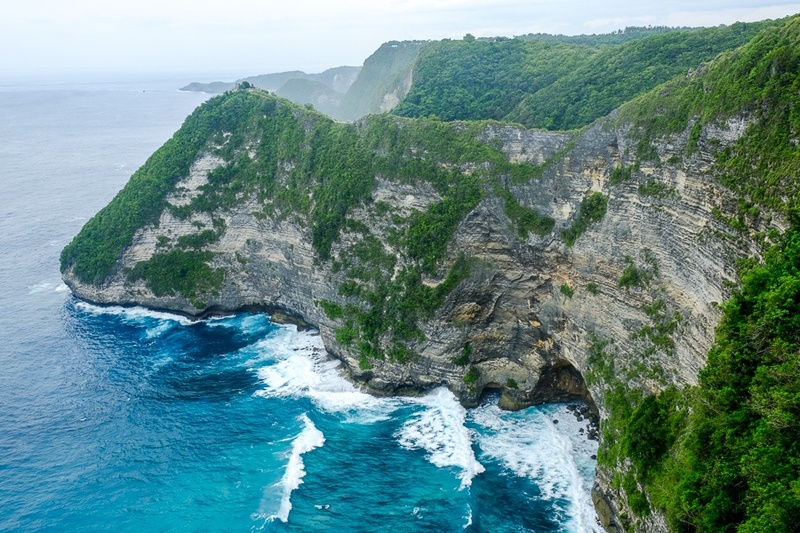 The Pererenan cliffs are on the west side of Nusa Penida island. This spot is accessible by car or scooter, about 1 hour drive from the main docks and accommodation in northern Penida. The road here is a bit rough, so take it easy. The parking fee at Pererenan is 15,000 IDR ($1 USD) as of 2019.